For the caramel drizzle; mix the hazelnut butter, 1 ½ tbsp of the maple syrup and the caramel extract until combined then whisk in the coconut cream until smooth. Set aside in the fridge. Pre-heat the oven to 180C, 160C fan, gas 4. Grease a 450g loaf tin and line with baking parchment. In a jug add the hazelnut milk to the vinegar and set aside for 10 mins. finely grate the zest of one of the oranges, slice the zest off the other one into thin strips and reserve for decoration. Blend 60g of the hazelnuts in the food processor until finely ground. In a medium bowl mix them with the flour, baking powder and bicarbonate of soda. Mix in the oil and fine orange zest with the hazelnut milk until smooth, add the Maple Syrup, then pour into the bowl with the dry ingredients, folding together gently using a balloon whisk until just combined. Pour into the tin and bake for 30-35 mins or until an inserted skewer comes out clean. Once cool enough to handle turn out on a wire rack to cool completely. Drizzle over a little of the caramel topping (serve the rest on the side), chop the remaining hazelnuts and sprinkle over the cake along with the zest strips. 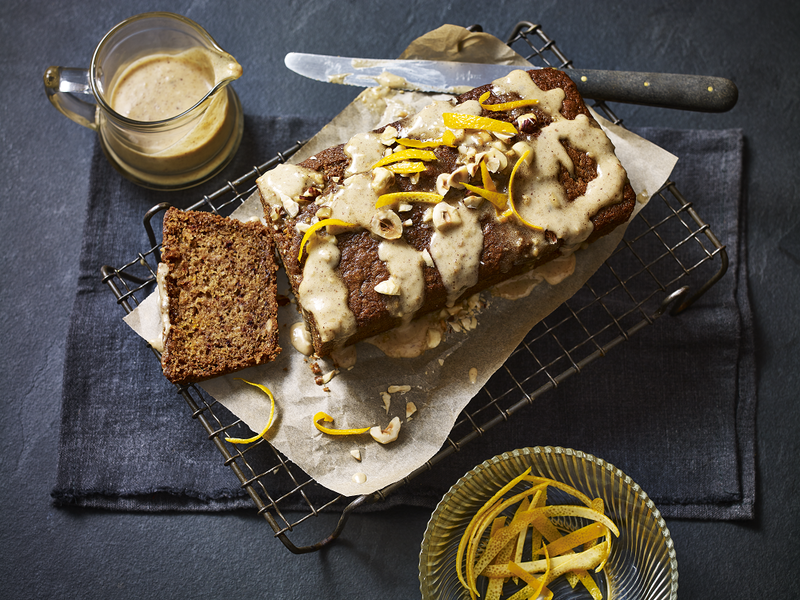 Orange, Hazelnut And Caramel Vegan Loaf. Recipe and image courtesy of Dr Oetker. 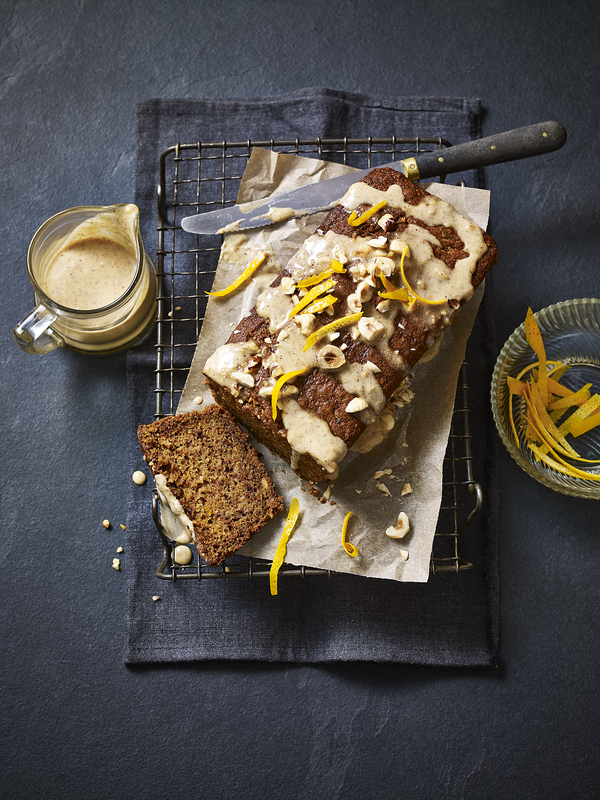 What do you think of this Orange, Hazelnut And Caramel Vegan Loaf? Vegan Chestnut And Beetroot Wellingtons With Watercress Pesto. Pyrex – Vegan-Friendly Spiced Wild Rice. "Fancy Making An Authentic Massaman Thai Curry?" "How To Make A Cannoli Pie: Cake Anyone?" This looks amazing! Yes, please! This sounds amazing! Would love to try some. Thanks for stopping by. Hope you get to try this recipe. Let us know how you get on. Is Caramel Flavour the equivalent of Caramel Extract? I like to think my UK English to American English is up to date, but this one escapes me. Thanks for stopping by. I am not 100% sure but I am guessing it would be very similar.